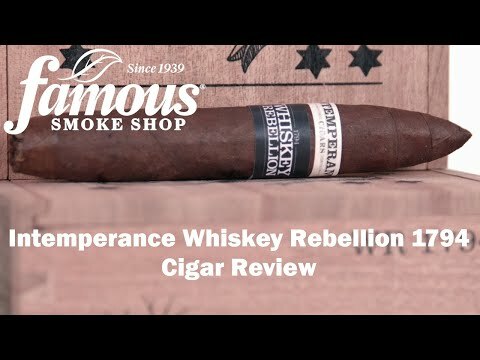 Intemperance Whiskey Rebellion 1794 cigars are a full-bodied, full-flavored edition created by Skip Martin of RoMa Craft Tobac. This selection pays tribute to the historic protest against the tax on spirits imposed by Alexander Hamilton to pay back the Revolutionary War debt, and each size is named for one of our young nation's patriots. A hearty blend of Dominican and Nicaraguan long-fillers held together by an Indonesian Bezuki binder leaf are seamlessly rolled in a dark, oily, and high-priming Ecuadorian Habano wrapper. The smoke is ultra-smooth with well-balanced layers of earth, charred wood, sweet and peppery spices, espresso, and some pleasant floral notes. If you enjoy dark, complex, full-bodied cigars, this is one rebellion well-worth joining.